Can You Make Coconut Water Kefir or Coconut Milk Kefir With Kefir Grains? I have lots of requests from people who want to make non-dairy kefir water or kefir milk. I also have many people writing to tell me how they have failed. I had tried and failed on many different occasions to make kefir soda from coconut water before I figured out why it did not work out so well. So how come I couldn't make coconut kefir with my kefir grains when so many people say it is possible? 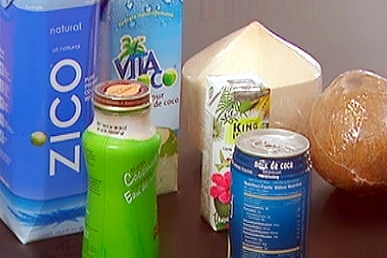 A big problem in Canada is that coconut water, and some coconut milk, is sold in tetra packs and they have preservatives for an extra long shelf life. Even the larger containers can have enough preservatives in them to unbalance the bacteria and yeast of the grains. (Maybe they don't use preservatives in their coconut water in other parts of the world. This is a big deal. If the sulphates preservatives on a single fig will kill your grains, what do you think will happen when the whole drink is laced with it? If you guessed, "a smelly stinkin' mess!" you win the prize! If you guessed, "disappointment and despair!" you would ALSO be absolutely correct! I am a bit of a perfectionist… don't I hate it when something is not right several times over, when everyone else says it works! There is another problem with making non-dairy kefir milks. The 'internet' says that you can make kefir milk using non-dairy milks like almond or coconut milk and using milk kefir grains. First, this is not an option for a vegan. Milk kefir grains are made from milk, and they must be put in milk every so often or else they will die. They live by eating lactose. So here is the solution that WORKS (because I tried it!) and keeps everyone happy. Don't use kefir grains to make coconut kefir milk or kefir water. Instead use the water kefir you have made with the water kefir grains. By now you probably already know that kefir makers often will do a second ferment of their kefir. So using the concept of a second ferment I had an idea. First you need to buy water kefir grains and follow the water kefir recipe to make your kefir soda. Then you strain off the grains like you normally would, and use them to make your next batch of kefir water. NOW take 1/4 to 1/2 cup of finished water kefir, and put it in a jar with 2-4 cups of coconut milk or coconut water and let it sit for another 24-48 hours. (I used 1/4 cup for coconut milk and 1/2 cup for coconut water). NOW you have a truly vegan coconut kefir and you didn''t have to go through 2 cups of kefir grains before you got it! Hello, I have been making coconut kefir with coconut milk. It is a brand I found a Walmart with only water and coconut, no additives or sugar. I love it for everything, coffee, teas, desserts and now kefir. I do have to add water to it since it is so thick. I love it so don’t take my comment wrong. I have been making it for about 5 months now. I don’t do dairy so this works out great. I do use goat milk to grow my grains. So this could be my problem!!!!! Anyhoo, after I started making and drinking my own. I started gaining weight. I have been paleo for almost 4 years now. NO Sugar or .gluten. . I have kept the weight off and all of a sudden after drinking kefir, I have put on over 13pounds. Also, I don’t take many pills, mostly vitamins and oilsl, Very careful what goes in. I love my kefir , especially when I mix with freshfruit? Am I drinking too much? Is it the coconut milk? I let it ferment 24 hours, is this too long? Next Next post: Live Dirty, Eat Clean To optimize Your Micrbiome for Health!